The concept of bodhisattva is not clearly defined in Buddhism. Actually, the Bodhisattvas are symbolic figures or Yidams of a specific Sadhana. In original Buddhism there were no Bodhisattvas except Maitreya. In the later Mahayana model of the Paccekabuddhas and Savakabuddhas these are under the Bodhisattvas and are not yet real Buddhas with Nirvana. The southern Mahāsāṃghika schools like the Caitikas favored the Bodhisattvayāna over that of the Arhat and śrāvakayāna. They saw Arhats as still in danger to fall off and as still partly ignorant. The Mahayana ideal is to become a bodhisattva for the salvation of all beings from samsara or for their reaching of the other shore of enlightenment, and finally to reach the state of a Buddha. Here is the Bodhisattvayana in the focus. The Bodhisattva - vow is intended to underpin the aspiration. After the Mahayana, a Bodhisattva strides through a pre-path of 10(14) steps(bhūmis) as thy are for example described in the Daśabhūmika -Sutra of the Avatamsaka. The jewel necklace Sutra describes 52 steps of Bodhisattva practice. A bodhisattva of the seventh step of ten is called mahāsattva. A developed bodhisattva should be from the second other shore, and thus may possess small forces or siddhis. 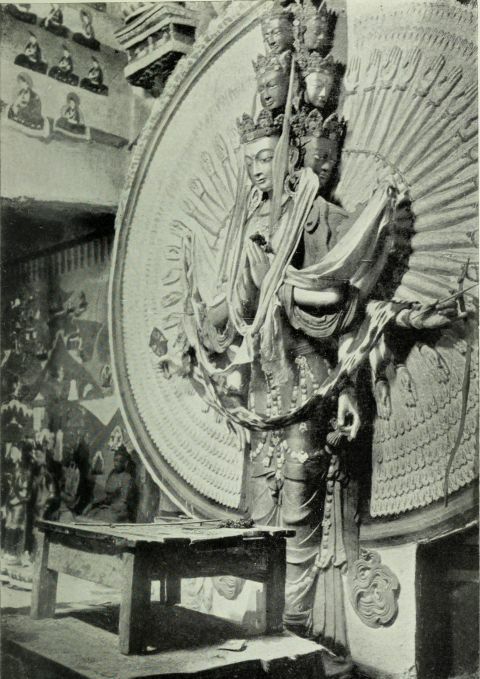 After crossing the 10 Bhumis, a Bodhisattva attains the Buddhashaft (Bodhisattvayana). Gampopa's 'jewel jewelery of liberation' (also known as Lamrim) also teaches a stepped path which, however, does not detail the universal transformation process. The training of Bodhicitta (Enlightenment Spirit) and Paramitas (Virtues) and the root-vows are to point the direction. Yidam forms, such as those of Avalokiteshvara, Buddha Vairocana, and Buddha Amitabha, are certainly capable of achieving the true Buddhaship, which is result of a development and transformation process. Chapter 26 of the Avataṃsaka-Sūtra (Dasabhumika Sutra), which is attributed to the Ekayana, enumerates 10 levels of bodhisattvaship. The Surangama Sutra knows 57 steps. The Gandavyuha Sutra sees the acting of the highest bodhisattvas more generally and impersonally directed to all beings. 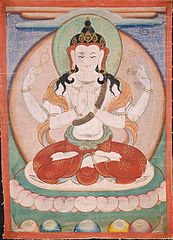 Known Bodhisattvas are Akashagarbha(Shingon), Avalokiteshvara (Guānyīn), Ksitigarbha, Mahasthamaprapta, Maitreya, Manjushri, Mahamayuri, Nagarjuna, Niō, Padmasambhava, Prajñāpāramitā, Samantabhadra, Sangharama, Sarvanivaranavishkambhin, Shantideva, Sitatapatra, Skanda , Supushpachandra, Suryavairocana, Tara, Vajrapani und Vasudhara. Padmapani, Vajrapani, Samantabhadra, Maitreya, Ksitigarbha, Sarvaniva Ranaviskambhin, Manjushri und Akashagarbha are also called Mahabodhisattvas. 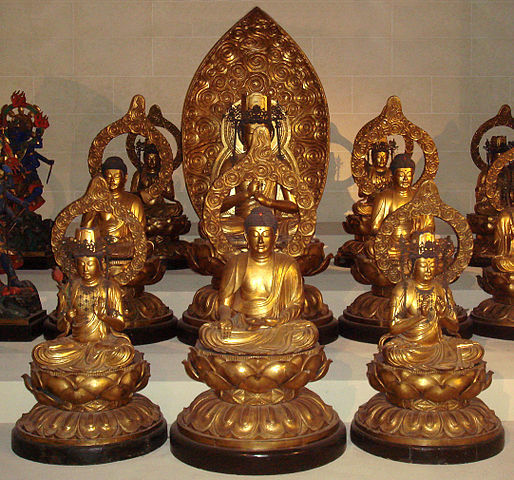 Mañjushri, Avalokiteshvara, Vajrapani, Maitreya, Kshitigarbha or Akashagarbha, Sarvanivaranavishkambhin and Samantabhadra are also called the 8 great bodhisattvas (Skt. aṣṭa utaputra; Tib. ཉེ་བའི་སྲས་བརྒྱད་, Wyl. nye ba'i sras brgyad, 8 near sons) and as the most important Bodhisattvas in the retinue of buddha Sakhyamuni. They represent the eight states of pure consciousness. The Theravada only knows the Bodhisattva Maitreya. A realized bodhisattva should have entered step 18 of the universal path, and at the end of 18 reach the first step of the Buddhaship (Nirvana, then Paranirvana and then possibly Mahaparanirvana). The tantric main practices of the Bodhisattvas also include the 10 Paramitas, the perfections which transport them to the other shore of enlightenment.